When there’s something wrong with the hot water heater, many homeowners experience a sinking feeling in their gut. They wonder what has gone wrong and how extensive the required repairs are going to be. They also wonder if they’re going to be able to afford water heater repair in Scotts Valley or if they need to figure out another option. When you work with us, we take as much of the stress and strain off of you as possible. We don’t want you to worry about your water heater, about whether it can be repaired or what will be involved in repairing it. We’ll come out, take a look at the situation, and let you know as soon as possible what needs to be done. We’ll also work with you as far as your budget is concerned. Even if you are stretched thin, we’ll help you figure out a way to get your hot water back. Do You Need a Water Heater Repair in Scotts Valley, CA? Sometimes, it can be hard to tell if you really need to call a professional to look at your water heater. Here are a few signs that something is wrong and it’s time to give us a call, before the problem gets even worse. You have no hot water. 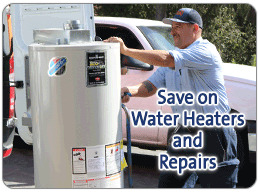 If your hot water is gone, it’s not going to come back until you repair your water heater. Give us a call and let us come figure out why your heater isn’t heating and what we can do to make it work again. Your hot water is lukewarm. Do you feel like you can’t even get comfortable in the shower anymore, even though the water is warmer than room temperature? It could be that your water heater isn’t heating well, so your water isn’t as hot as it used to be. Do check the temp gauge on your water heater first. Sometimes this gets bumped and all you need to do is put it back where you want it in order to have hot water again. Your hot water disappears. Do you feel like you used to be able to take a shower while the dishwasher was running but now you can’t? Maybe it’s time to have your water heater checked out. If it’s not holding hot water as long or there’s not as much of it, something has gone wrong that you’ll want to get fixed. Fast. Your hot water makes noises. Do you hear loud sounds in your pipes or coming from your water heater whenever you turn on the hot water? Then it’s probably time to call a professional. Something may have come loose or you may have sediment in your water heater We’ll help determine the problem and craft a solution. No matter the problem with your hot water heater, we are the professionals that people trust for water heater repair in Scotts Valley. Our plumbers are top notch, and they’re polite, too. Give us a call and we’ll show you exactly why so many people choose Rosenthal.